While Gibson Electric Membership Corporation cannot control the severe weather that sometimes causes power outages, we work year-around to reduce the frequency and duration of outages through our vegetation management program and our pole inspection and treatment program. Tree trimming and all phases of vegetation management are essential to ensuring reliable electric service. With more than 3,500 miles of electric line stretching over twelve western Kentucky and Tennessee counties, there are many opportunities for tree limbs to come into contact with electric lines. This tree limb to electric line contact is the primary cause for electric blinks and power outages. Vegetation management is so important to your service reliability that it is one of Gibson EMC's largest ongoing expenses. Picture: As part of Gibson EMC's commitment to the communities it serves, and in celebration of Arbor Day, each year the cooperative plants trees in different parts of its service area. 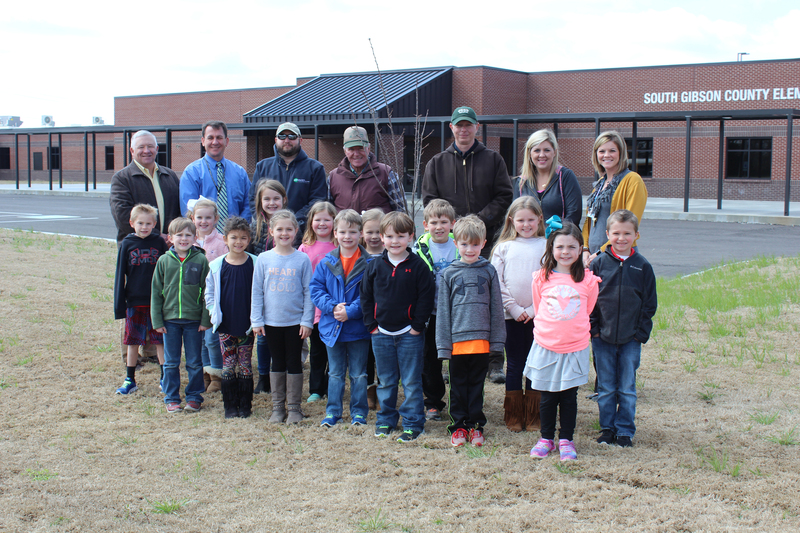 In March 2018, Gibson EMC planted several trees at the new South Gibson County Elementary School. When thinking about your home or neighborhood, chances are you will not be thinking about the electric lines. It is easy to overlook their presence, as electric lines can run alongside property lines or near trees. Nevertheless, electric lines can pose serious hazards. Trees can be electric lines' worst enemy. Strong winds and storms can blow trees over or break branches, pulling electric lines down from poles or supporting structures. It is possible for the line to remain energized and potentially electrify the tree and nearby objects. Treat all electric lines as energized and never go near a downed line. If you see a downed or low-hanging line, immediately call Gibson EMC and try to keep others from going near it. Maintain a safe distance (at least 10 feet) from electric lines. Always survey the area for electric lines before you begin to cut down any tree or trim branches. Never go near a tree that has fallen onto an electric line. Do not go near a tree if its limb has fallen onto an electric line. Never plant trees or shrubs directly under electric lines. Plant medium-sized trees, those that grow no taller than 40 feet, at least 40 feet away and those that will grow taller at least 50 feet away.